There are around a half a billion bicycles in China---about 1 bicycle per household---more than any other country but this was down from from 670 million in the 1990s. There are seven million registered bicycle riders in Beijing and 6.5 million in Shanghai. In most places bicycles outnumber cars at least 10 to 1. A Beijing New York Times reporter wrote: “Bicycles can be found on every street, and they come in an array of shapes, sizes and uses. There are bikes with cargo beds that carry everything from bags to trash to new sofa sets. There are electric bikes and miniature scooters. Children bounce on the luggage rack behind their parents, and older women teeter on even older bikes. No one wears a helmet.” It is not uncommon to see bicycles with caged songbirds dangling from the handlebars. While riding in a black Audi sedan, the Vice Mayor of Beijing, Wang Baosen, told the New York Times, "Riding a bike helps you exercise. It can also help save energy, it reduces pollution and it is very convenient for mass use." 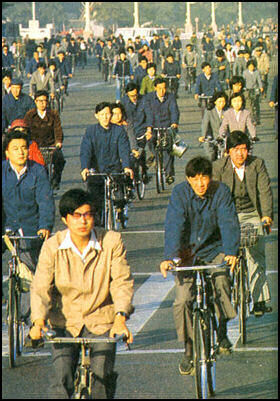 In the Mao era bicycles were regarded as one of "three bigs"---along with a sewing machine and wristwatch. People placed their names on waiting lists for years to get them and took out loans form the factories where they worked to help pay for them. Chinese valued bikes in part because the public bus system was so bad and owning a car was impossible. Many cities had wide bike lanes, ample parking spaces on the sidewalks and bicycles had the right of way at intersections. The first bicycles with air-filled rubber tire seen in China were ridden by two Americans, named Allen and Sachtleben, who ended a three-year bicycle journey from Istanbul to China in 1891 recorded in the book Across Asia on a Bicycle. Not long afterwards the child-emperor Puyi passed many hours in the Forbidden City riding around on a bicycle given to him by his Scottish tutor. Around 20 million bicycles are sold in China for the domestic market. These days more Chinese-produced bicycles are sold for export. In China The sale of mountain bikes and multi---geared bikes is rising in China as sales of traditional clunkers is declining. Bicycles are increasingly being looked upon as recreation vehicles as well as means of commuting and running errands. According to a Beijing radio station sited in an Asia New Network article the number of people in Beijing that used bicycles for some of their transport needs fell from 60 percent in 1995 to 20 percent in 2010. It also reported that 40 percent of car owners in China use their cars to drive less than five kilometers, a distance that could easily be covered on a bicycle. Bike commuters in the 1980s Electric bikes known s as e-bikes have become very popular in recent years. Costing $200 to $300, they can reach a top speed of 30kph and go 50 kilometers (more with pedaling) on a single charge of electricity that costs 16 cents. The lead-based batteries can be charged overnight. They last for about a year before needing to be replaced and can be recycled. In some cities they account for 50 percent of all bicycles used. The Chinese ride their bicycles in the rain and snow. Up until fairly recently when it rained in Shanghai, the streets filled with bicycle riders in blue, yellow, red and purple ponchos. There were so many bicycles in Shanghai that sometimes traffic stammered to a halt with bicycle gridlock. China has roads and reserved for bicycles. Roadside bicycle repairmen are common sights. Each year there around 350 bicycle related fatalities in Shanghai. Chinese cyclist often ride against the flow of traffic, swerve suddenly and come flying in off of side roads without looking. Posters of cyclists horribly mutilated in accidents are hung up all over town. Cyclists who have survived several accidents are often sent to "re-education classes." 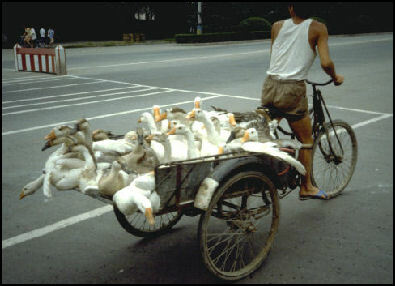 The Chinese perform modern day miracles with their bicycles and tricycles. National Geographic reporter Ross Terril witnessed a double bed with a floral mattress, boxes of hens piled eight feet high and tied together with string; and a purple velvet sofa and a wardrobe---all carried on the backs of bicycles and tricycles. Farmers take 100 kilogram pigs to slaughter on the back of tricycles. These days, bicycle use is declining in many places as more and more people have access to cars. In 1998, bicycles were banned from East Xisi Street, near the Forbidden City in Beijing, to make it easier for car traffic. Violators were chased down by guards with bullhorns and red arm bands. The ban was extended to other streets later on. Many people were angered by the ban. Bicyclists were angry they had to take a longer route and environmentalists said it sent the wrong message at a time when Beijing has recording some of the world's worst air pollution. Bicycles were banned from all major roads in Shanghai in 2004 to make more room for cars. One Beijing cyclist told the Washington Post, “The drivers are very aggressive. They won’t wait for you for a second. The road belongs to them now.” Some studies indicate that the decline of bike usage may be short-lived as the practicality of a bicycles kicks in and the novelty of car driving wears off. more car and bike crashes Each year China produces 17½ million bicycles, three times as many bicycles as it nearest rivals, Japan and the U.S. If these bicycles were lined up together they would stretch three quarter of the way around the world. In the Mao and Deng eras China produced even more. At its peak, the Shanghai Forever Bicycle Company alone produced 33.5 million bicycle every year, and one out of every four Chinese rode a bicycle made at this factory. Most of the bikes made there were black one-gear models made from water pipe known as Flying Pigeons. Models exported to the U.S. were called Wind Catchers. Many of the sophisticated road bikes and mountain bikes sold around the world today are made in China or Taiwan. What to do with old, rusting bicycles is a big problem in many Chinese cities. Recycling centers are a rarity. Many people dispose of their bikes by abandoning them in fields, parking lots or alleys where they can remain for months.